The Squirrels went to a rainswept Cerezo Osaka and took all three points in a fantastic 3-1 away win. Goals from Novakovic, Watabe and Aoki sealed the win. A win which unfortunately due to the incredibly close nature of the J1 league has not made us safe, but nevertheless it's a win that keeps our heads just above the water and moves us a step nearer to the longed for safety. A terrific performance from the lads, and a team performance. In the wet conditions of the first half and the slightly better conditions of the second half, Ardija played as a unit and errors - passing or defencive ones were kept to a minimum. Scoring three goals away from home is no mean achievement for any team, but for Ardija to do so at this late stage of the season, when victory could mean so much, it was a great performance. With Kobe and Gamba both winning away from home too, it kept us above those two relegation rivals and out of the bottom three. It has to be said that the team has improved under Verdenik and he has turned the team around from one which looked a shambles, poor passing, weak defending, too many errors, and an ineffectual attack that generally failed to frighten the opponent's goalkeeper let alone the back of the net, into a working unit. In this game the team never lost it's shape. Each part of the unit knew it's job and did it mostly well. Players knew where each other were and looked to find them with direct passes or passes to run on to, and we broke with speed and looked likely to score. 5-1 or 6-1 would not have surprised me at the end of the game. The addition of Zlatan and Novakovic, though initially viewed by some fans with scepticism, has proved to be a success and they have shown themselves to be valuable members of the team, providing goals (including hat-tricks from both players) and leading the front line as well as working hard for the team. Let's not get too carried away, and I may have already done so! But this was a good performance, when I had expected a nervy, edgy showing from Ardija, understandable given our precarious position. Ardija don't do nervy and edgy well. Does anyone? Albirex at home only 3 weeks before this game was a distinctly poor showing, when in that game I thought the opposition were unlucky to lose the game, and looked much better than the Squirrels who seemed aimless, error-strewn and shapeless. The team against Cerezo, with only Zlatan and Watanabe missing from the Nigata line-up, looked a different set of players. Let's hope the confidence shown during this game and gained from the result will carry on into our last two crucial games of the season, home to Jubilo and away to Shimizu. Hello Shizuoka! What do you have in store for the Squirrels?! Back to the Cerezo game and Novakovic kicked things off with a first half strike from a free kick, which was superb, then in the second half we went 2 nil up through a swift passing move that came on the counter that lead to Watabe's goal and was exciting to watch as we swept forward and extended our lead. Cerezo hit back with a goal but never really threatened to get even and when an error from Cerezo defender Kim gave Aoki the chance to make it 3-1 the points were safe. The win came without Brazilian midfielder Carlinhos, a player whose performances earlier in the season have been underestimated due to the poor quality of the side at that time. He does a lot of the groundwork in front of the defence and likes to get the ball forward to the more creative midfielders quickly. Some of his work on the pitch is important but maybe goes unnoticed as fans prefer to focus on the flashier elements in the side now the team is playing better. Yet when those players were badly misfiring earlier in the season I think Carlinhos helped to keep us afloat at times. I don't know if he is injured or just doesn't fit into Coach Verdenik's vision for the team now, and I am not sure how much longer he will be at Ardija. I hope to get the chance to watch him play and bury one of his piledrivers in the back of Jubilo or S-Pulse's net. A final note on this game. A fillip to the fans who travelled all the way to Kansai to watch the team play in terrible conditions and seeming to stand on what looked very much like a grass bank terrace. I may be wrong about this, but that is what it looked like on the television. I am surprised that such an away end has passed the standards required for a J1 or J2 team. I don't think it would in many other footballing nations, certainly in Europe. It must have been a wet and muddy experience. Thankfully the players gave the fans a performance to enjoy and to forget the conditions. Next up is a home game to Jubilo Iwata. 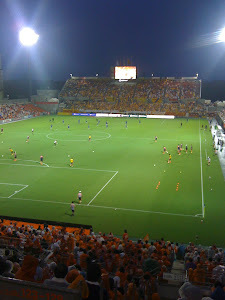 Ardija fans will be looking for a similar performance and result.